Ask any talented job hunter: Did you follow the proper steps in your job search? Of course. What went wrong? I hit an unexpected obstacle. Success in job hunting isn’t about chasing job postings, sending resumes, and filling out endless online application forms. If any of it worked, you’d have the job you want. 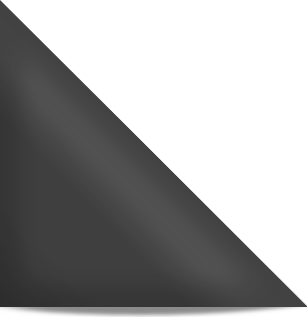 (Employment In America: WTF is going on?) That’s why Ask The Headhunter is not a step-by-step “process” for landing a job. There is no such thing. The sad truth is, the “employment system” is broken. Your challenge is to step over that broken system to get the job you want. Once you get it, how to land the job you want is obvious. 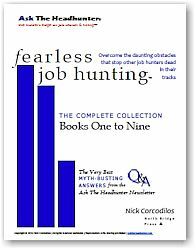 Each of the 9 Fearless Job Hunting books shows you how to overcome daunting obstacles that stop other job hunters dead in their tracks. Get the edge — and say hello to total control over your job search. Order just the books you need, or The Complete Collection. Or start with what’s free: Hundreds of articles, how-to advice, and in-your-face answers to real questions about the most daunting obstacles real people face when job hunting. Employers can learn a thing or three, too. They succeed by beating the System: By knowing the best way to handle a few make-or-break situations, thereby setting themselves above their competition. It’s time to throw away your resume or your job description and Ask The Headhunter. 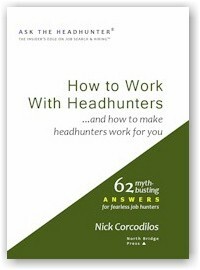 Nick Corcodilos is a headhunter, and he’s the author of How to Work with Headhunters… and how to make headhunters work for you. And he’s here to help you. Since 1995, Nick has been here, online, revealing the fallacies that conspire to keep talented workers and good employers apart — and openly sharing the headhunter’s sound, profitable methods for getting them together. 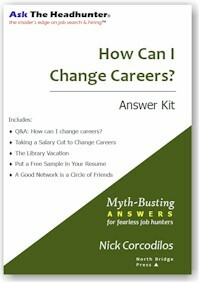 If you’re changing careers — or changing jobs — Nick’s Answer Kit: How Can I Change Careers? will show you how. Most job hunters flounder when it’s time to make a change. HCICC? teaches you how to get in the door, and how to prove to a demanding employer that hiring you will pay off. Or, don’t buy anything. 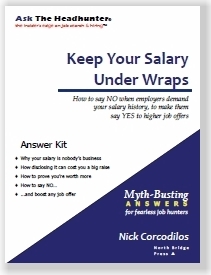 But learn why you must stop telling employers your salary history. They’re using it to cap any job offer they make. Since starting Ask The Headhunter in 1995, I have answered over 45,000 questions about job hunting and hiring — one at a time, in writing, on the Ask The Headhunter discussion board. ATH has grown into a vibrant dialogue with thousands of people who recognize that America’s Employment System is broken. They want an edge when job hunting — just as managers want an edge when hiring. Ask The Headhunter isn’t about resumes, interviews or job postings — and it isn’t about doing tricks to get jobs. It’s about job hunters and employers rolling up their sleeves and demonstrating to one another that there’s value in working together. Each week, in the Ask The Headhunter Newsletter, I share perspectives, methods, and tips to help you be your own headhunter. We tackle the most daunting problems faced by both job hunters and hiring managers, and I do my best to address your questions head-on. The newsletter is delivered via e-mail. It is not archived online. And it’s FREE! Newsletter subscribers can submit their questions to a special e-mail address that comes direct to me. Each week, I personally select the best ones and I answer them in the newsletter. Want to get in on the dialogue? Visit Ask The Headhunter and sign up for free notices of updates. Chime in with your comments. Debate, argue, post your questions!